‘Happy Birthday, Midleton!’ The Charter of Midleton was issued 345 years ago by King Charles II. King Charles II granted the Charter of Midleton to Sir St John Brodrick in 1670. He also gave his name to the former Charles Street in Midleton, now Connolly Street. These are the words that give the town of Midleton in County Cork its modern name. As you can observe, spelling was rather flexible in those days. The above statement is buried within the charter issued by King Charles II to Sir St John Brodrick in June 1670. We have already noted in a previous post that the date of the charter ( ‘…the Tenth day of June in the Two and twentyeth year of our Reign & in the year of Our Lord One Thousand Six hundred and Seventy…‘, 10 June 1670) was actually ten days behind the corrected calendar authorised by Pope Gregory XIII in 1582, but the British, being suspicious of any ‘papist’ innovations, preferred to stick to the old Julian calendar until 1752. So the correct date for the issuing of the Charter of Midleton is 20 June 1670, which is why I’m discussing it now. On Thursday 18 June I spent the morning at the Cork Archives examining the only copy of the charter to have survived. This is a manuscript copy made by Rev Mr Verney Lovett on Saturday, 7 February 1784 and copied ‘verbatim’ from the text then preserved in the Rolls Office in Dublin. Anyone familiar with Irish history will know that the Public Record Office in Dublin was destroyed at the outbreak of the Civil War in 1922, thus incinerating centuries of Irish historical records – including the text which Mr Lovett consulted. The fact that Lovett made a copy of the charter suggests that the original Charles II charter document given to St John Brodrick had already vanished. The Rev Mr Lovett, being a burgess of Midleton, was obliged to make a fair copy from the surviving record, which he had neatly bound in a soft leather cover with the inscription Charter of Middleton 1670 embossed on it. Clearly this was intended to be a working document for the charter only takes up thirty pages, with most of the folio being blank. John, 1st Baron Berkeley of Stratton was the co-founder of New Jersey with George Carteret. He was Lord Lieutenant of Ireland when Sir St John Brodrick applied for a charter. Despite is relaxed attitude to Catholics, Berkeley got on very well with the staunchly Protestant Brodrick. The charter was issued by the king on the suit of Sir St John Brodrick (or Broderick, as the text has it) on the advice and consent of ‘our Right & well beloved cousin John Lord Berkeley Lieutenant General & General Governor of our said Kingdom of Ireland‘. This was John, 1st Baron Berkeley of Stratton, who with Sir George Carteret founded the Province of New Jersey in North America in 1664-1674. Berkeley had fought for Charles I in the Civil War and was exiled during the Commonwealth. 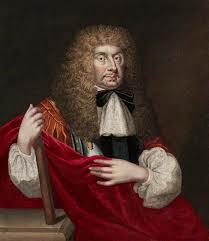 Appointed Lord President of Connaught for life in 1661, he appointed a deputy to do his work there shortly thereafter. Berkeley was sent back to Ireland as Lord Lieutenant in 1670 and stayed in office until 1672. He was considered very pro-Catholic (not surprising given his French and Spanish-Netherlands exile under Cromwell). This apparent pro-Catholic stance makes Berkeley’s friendship with Sir St John Brodrick all the more surprising, for Brodrick was a staunch low-church Protestant. 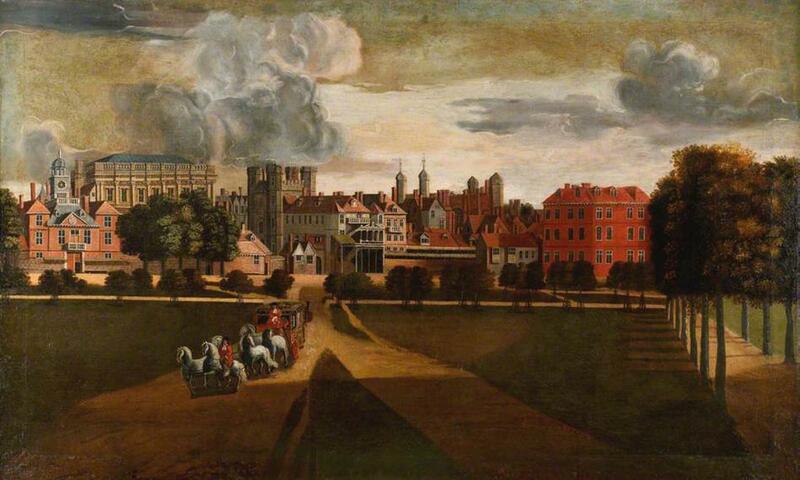 The sprawling Whitehall Palace was originally Cardinal Wolsey’s London residence, then the residence of Henry VIII. More of a town than a coherent palace, it burned down in the 1690s, to the relief of William of Orange who hated its damp atmosphere. It was from here that Charles II issued Letters Patent to Berkeley to draw up the Charter of Midleton. The charter was issued from Whitehall Palace under letters bearing the king’s privy signet and sign manual (the king’s personal seal and signature) but was formally registered in the rolls of the High Court of Chancery of Ireland on 3 January 1671. 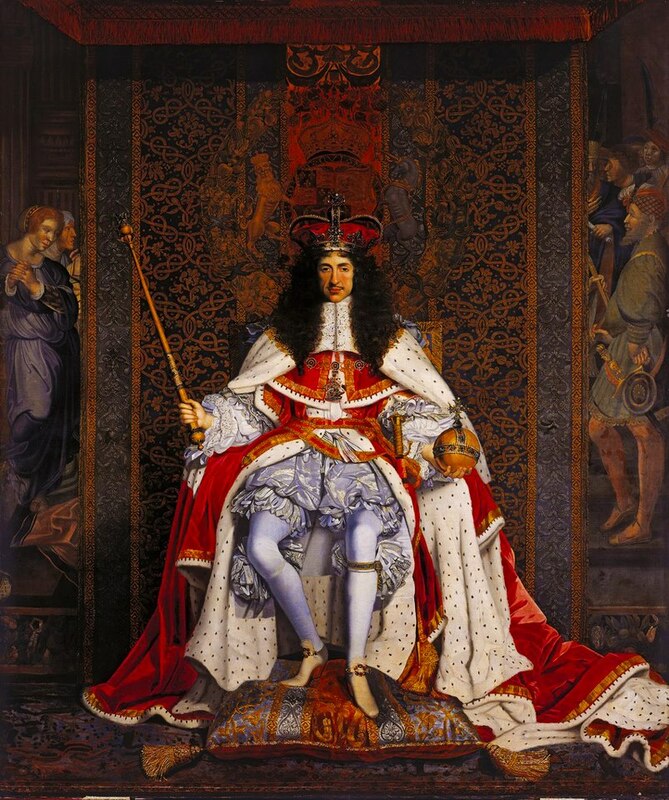 This was a month overdue since the king had commanded that the charter be enrolled within six months of issuance – so it should have been enrolled in early December 1670. The legal profession’s Christmas break must have delayed matters. Charter of King Charles Ii to the colony of Rhode Island, 1663. This is what an actual charter document looks like. Sadly the Midleton charter seems to have vanished by 1784 when Rev Verney Lovett made his copy from the Chancery Rolls copy. So what exactly was a charter and what did the it do? 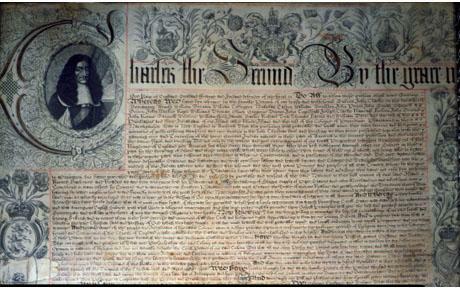 A charter is a legal document that could be issued by an authorising authority (the king) under its seal granting certain legal rights and privileges to a person, or a group of persons, or to a place or estate. This particular charter did three things. Firstly, as we’ve already discovered, the charter named the town formerly known as Mainistir na Corann or Corabbey as Middleton. To be honest, I was intrigued to note that the spelling Middleton appeared to apply only to the town, with the spelling Midleton applying only to the manor or estate of Sir St John Brodrick – until the spelling of the town’s new name changed near the end of the document – Middleton or Midleton were used for the name of both the town and the manor interchangeably. Perhaps there was a change of clerk during the drafting of the charter? it should be noted that this new name for the town is the only part of the charter still in force. However the charter actually opens with the erection of the estates of Sir St John Brodrick into a manor, or Mannor, as it is sometimes spelled. A manor was an estate with specific identity bearing clear legal rights and powers. These rights and powers would apply to specific denominations of land. In the case of Midleton these were spread over four baronies. grouped by barony the denominations were the townlands of Castle-Redmond, Corraby, Killeagh, Knocknagoure, Knockgriffin, Curtistowne, Cahirmoan, Storm.Cotter, Carrigbane, Coppingerstown, Butlerstowne, BallyBane, Ballyrarla, Ballysimon,Ballymartin, Ballyknock & Coolerath, Rathcannon, Donigmore,& Kippane, Monemerrig, Bridgefield, Carrignasheny & Lictur Dowre, & Coolcurrig, Dromfaranie in the barony of Imokilly. Clearly the Imokilly lands constituted the larger part of the manor. Then came Garriduff, Knocknacottig, Ballyannan, East Ballyvodick, West Ballyvodick, Ballintubber, Ballinecurrig, Ballyhasna, & Glanawillin in the barony of Barrymore.The outlying denominations were Donivally Ballygreggin, Temple Roane & Killehenisk in the barony of Fermoy, with Gallinguile and Kilbrony in the barony of Orrery in North Cork. All of these denominations were in the county of Cork. All of these lands were to be constituted an ‘intire Manor‘ with all the rights and privileges attached to a manor. Clearly the intention was that the estate should remain complete and intact for evermore. The most important right attached to a manor was the right to hold manorial courts. There were three such courts in the Manor of Midleton: a Court Leet and View of Frank Pledge, and a Court Baron, and a Court of Record. Sir St John Brodrick could exercise his rights to hold these manorial courts by appointing one or more seneschals and a recorder to preside over these courts. The Court of Record was given jurisdiction over actions ot the value of £200 in English currency! This was a surprisingly large sum at the time. A Bailiff Minister was to serve as the agent of the Court of Record. In addition to keeping his manor courts, Sir St John Brodrick was given the right to keep and maintain a prison and to appoint a keeper to serve the Court of Record. St John Brodrick was also granted the right to create a demesne of 800 acres for his exclusive use and to enclose a ‘park venery’ (deer park) and rabbit warren of 800 acres ‘more or less’! Indeed he did create a deer park at Cahermone which ran right up to the edge of the town (hence the two townlands of Park North and Park South). This park existed right up until the estate was sold off under the Land Acts of the late 1800s and early 1900s, although by then it was much reduced in size. And just in case anyone didn’t understand how powerful Brodrick had become, the lord of the manor was to ‘…have, receive, perceive, seize, Enjoy & convert….’ all ‘…waifs, strays, ffelons, goods of fugitives, & Deodands, ffishings, weers, Royalties, free warren & privileges…‘ for his own benefit, profit, use and enjoyment! It was the Lord of the Manor who controlled the town’s market – he was obliged to appoint a ‘clerk of the Markett‘ to keep order in the market and to collect the dues owed to him by the stall-holders. Seal of the Corporation of Midleton as illustrated by Samuel Lewis in the Topographical Dictionary of Ireland. The spelling of Midleton was amended in the 19th century to prevent the mails from going astray! The final major decision under the charter was to constitute the town on the estate as a borough as noted at the head of this post. The borough would ‘…extend into the said county of Corke every way from the middle of the said town one hundred acres in the whole….‘ Within the town there was to be a ‘..body Pollitick & Corporate consisting of one Sovereign, Two Bailiffs & two Burgesses.‘ This posed a problem for Mr Verney Love, because a few lines later we find that the Corporation would consist of .’…a Sovereign, Two bailiffs & TWELVE Burgesses.’ Mr Lovett underlined the word ‘twelve’ in his text, and, indeed, this was the structure of the Corporation thereafter, the same Corporation that Mr Lovett served on. This group of men would thereafter be called ‘The Sovereign, Bailiffs and Burgesses of the Burrough and Town of Middleton.‘. The charter names William Hutchings as ‘.. a free burgess & first & modern Sovereign.‘ He was to hold office until ‘…the Thursday next after the Feast of St Michael the Archangel...’ in 1672! Hutchings was obliged to be sworn into office ‘…before 29th September next before the Justices of Assizes of County Corke…’ taking the Oath of Supremacy, and other oaths as required by law, including the ‘Corporal Oath‘ of Midleton. September 29th is Michaelmas or the Feast of St Michael, an important date in the legal and academic calendar since it marked the start of the autumn law term. The sovereign was to be the sole coroner for Midleton and would serve as a Justice of the Peace for one year after the conclusion of his term of office. From 1730, the sovereign was usually the agent for the absentee Viscount Midleton, often holding office of sovereign for many years in succession. John Downing and John Gemings were appointed free burgesses and bailiffs of Midleton, also holding office until the Thursday following Michaelmas 1672. The burgesses were named as: Adam Wener, Peter Bettesworth, Richard Downing, Richard Walkham, Edward Laundy, Thomas Guard, John Wally, Nicholas Seward, Robert Cole, Thomas Knight, William Kinnagh, & Richard Hargrove. Cooper Penrose of Cork was a burgess of Midleton in 1784. 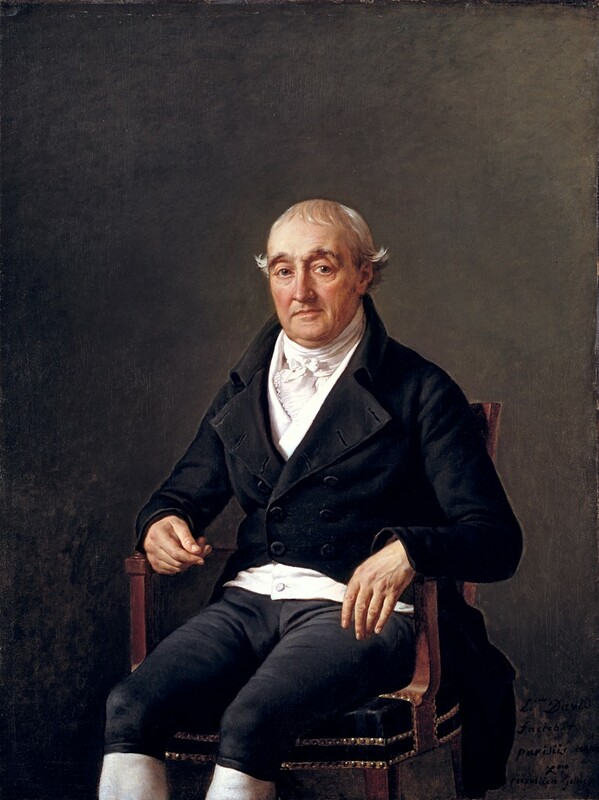 He commissioned this portrait of himself from Jacques-Louis David in 1802. This is the only portrait of an Irish subject by David. Sadly this superb portrait was sold by the family to a museum in San Diego. A huge loss to our artistic patrimony. Rev Verney Lovett usefully supplied the names of most of his colleagues on the Corporation in 1784: Martin Delany and Thomas Wigmore were the bailiffs that year. The burgesses were: George Courteney, George Courteney of Ballycrenan, the Earl of Shannon, Broderick Chinnery, Aubrey (?) McCarthy, Cooper Penrose, William Garde of Broomfield, Rev Verney Lovett himself, and Rev Laurence Broderick. The Courteneys were cousins, the Earl of Shannon’s Irish seat was at Castlemartyr, just a few miles east of Midleton, Brodrick Chinnery was descended from the first and second headmasters of Midleton College and was related to the Brodricks, Cooper Penrose was a wealthy Cork merchant, Rev Laurence Broderick was a cousin of the fourth Viscount Midleton at the time. Sadly Mr Lovett didn’t give us the name of the sovereign, but it might have been Rev Mr Green, Rector of Tullylease in north Cork – but this is uncertain. Built or rebuilt by George Brodrick, 4th Viscount Midleton, in 1789, the Market House is the most important building on Main Street. It replaced a market house dating from the 1680s and was the location for the Corporation’s meetings and elections, as well as being the Borough and manorial courthouse. 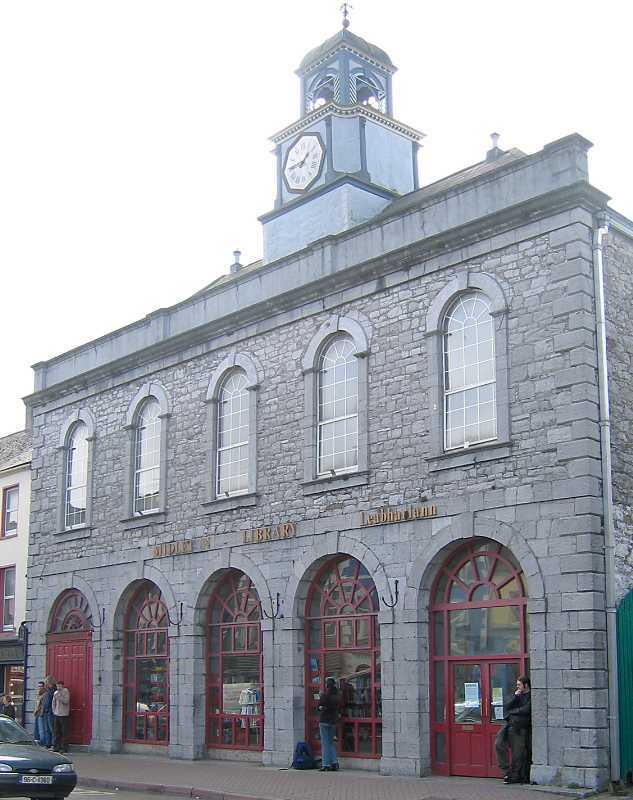 It’s now the town library. Historically only the central arch of the arcade was open – the rest were shops. Elections for the sovereign and bailiffs were to be held annually on the Thursday following the Feast of St James the Apostle, which fell on 25 July, with the officers taking office on the Thursday after Michaelmas. The sovereign, as noted above, rarely changed, but the bailiffs were changed almost every year. The sovereign, bailiffs and burgesses were to elect ‘two discreet burgesses‘ as members of Parliament to sit in the Irish House of Commons whenever a general election or a by-election was called. Furthermore, the sovereign, bailiffs and burgesses could admit any number of freemen to the town on payment of a 5 shilling fee to be used for the benefit of the Corporation. Sadly, there’s no surviving list of freemen. The Corporation was also free to possess and use a common seal for authorising Corporation business, with a design and inscription of their choice. They were also permitted to ‘…build or cause to be built in some convenient place in the said town of Middleton a common hall or Tholsell to be called the Tholsell of Middleton….’ wherein they might conduct the business of the Corporation. And to think we called it a market house or town hall all along! The Corporation was also permitted to organize a guild of merchants for the regulation of trade in the town (except the market) – but there’s no evidence that they bothered with this provision. 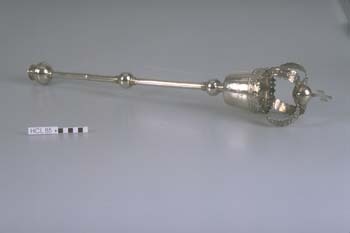 Not mentioned in the Charter, the silver Midleton Mace was almost certainly made by Robert Goble, a Huguenot goldsmith of Cork, around 1700 to symbolise the Corporation’s authority. It shows the Royal Crown on top with the arms of the Brodricks on the head. The mace is now preserved in the Hunt Museum in Limerick. The commissioners noted that even the manor courts had ceased to function, presumably because the courthouse built to the designs of Richard Pain in 1829 now hosted regular Petty Sessions of the County Court, which was much more independent of the landlord and Corporation. 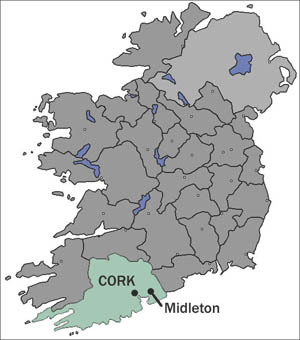 The Corporation of Midleton, along with many others in Ireland, was abolished in 1840. The manor had effectively ceased to exist as such after 1850 when the whole Midleton estate was spit in an inheritance dispute. From then on, all that remained, apart from hunting and fishing rights, was the name given to the town 345 years ago – Midleton. And to think that the place could have been called Charleville! But St John Brodrick’s friend, Roger Boyle, Lord Broghill and Earl of Orrery, had already appropriated that name in 1661 for his new town at Rathgoggan in Orrery barony in north Cork. So Brodrick’s town was named prosaically for its position half-way between Cork and Youghal. So today it might be fair to say……Happy Birthday, Midleton!